You can finally import Artisteer projects directly into Themler. Currently the import is available only for WordPress themes, but we're working on enabling you to export other types of projects from Artisteer and bringing them into Themler. Download and install the updated version of Artisteer (Artisteer 4.3 license is required). 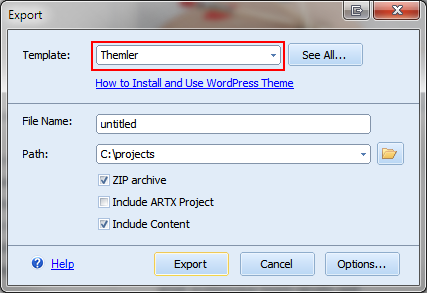 The downloaded WordPress theme can be then installed in WordPress and opened in Themler. You can finally import Artisteer projects directly into Themler. Currently the import is available only for **WordPress** themes, but we're working on enabling you to export other types of projects from Artisteer and bringing them into Themler. To try the new ARTX Import feature please: - [Download](http://files4.artisteer.com/Artisteer.4.3.0.60818.exe) and install the updated version of Artisteer (Artisteer 4.3 license is required). - Select "Themler" export type: !themler-export.png! The downloaded WordPress theme can be then [installed](page:3624) in WordPress and [opened](page:3626) in Themler.